The Federal University of Agriculture, Abeokuta (FUNAAB) has held the Graduation Ceremony for the second batch of the FUNAAB Foreign African Scholarship Scheme (FUFASS), amidst encomiums and accolades for the Vice-Chancellor and initiator of the programme, Prof. Oluwafemi Olaiya Balogun, who was described as a Pan-Africanist. The graduation ceremony, which also marked the commencement of Valedictory Celebrations in honour of the Vice-Chancellor, took place penultimate Monday at the University’s Senate Chamber. Making her remarks at the occasion, the Gambian High Commissioner to Nigeria, Her Excellency, Mrs. Angela B. Colley, extolled the initiative and foresightedness of the Prof. Balogun-led administration at contributing to the socio-economic development of other sister African countries, through the FUFASS Skills Acquisition Training Programme. Describing the Vice-Chancellor as “a Pan-Africanist, a lover of humanity and indeed an achiever”, the Envoy said the Republic of The Gambia and other beneficiary sister countries would forever live to remember the good works of “such a great luminary”, Professor Balogun. According to her, “I have personally been inspired by his calm and calculative nature, crowned by his firmness and great sense of reason in decision making. This has manifested in his commitment to see that young people, not only of Nigeria but the sub-region were trained in specialized skills that would have direct and positive impact on them”. The Gambian High Commissioner, therefore, called on the beneficiaries to work assiduously to promote Agricultural practices and help prevent hunger and malnutrition. The Chairman of the occasion and Executive Secretary, National Universities Commission, Professor Julius Okojie commended the Governing Council, Vice-Chancellor and the Senate for sustaining the high academic standard of the University. The Executive Secretary, who was represented by Professor Ekaneren Essien, a former Vice-Chancellor of the University of Uyo, described FUFASS as no mean feat in the history of University education in Nigeria and as a foremost internationalization platform in Africa. Professor Okojie recounted the efforts of the Nigerian government and the NUC in promoting skills acquisition and students’ entrepreneurship in technical training and development, through the Industrial Training Fund (ITF) and the Students’ Industrial Work Experience Scheme (SIWES). The NUC boss lauded the visionary leadership of FUNAAB in weathering the storms of lack of funds, unfavourable business environment by galvanizing continental efforts through the introduction of FUFASS, thus inviting participants from African countries to benefit from the magnanimity of the Nigerian government. Professor Okojie promised to use his position to champion the cause of the programme which he said he believed so much in, noting that “the future is certainly brighter for the African continent if we continue to sustain this new found spirit of sharing our collective endowments, towards building a new Africa that we shall all be proud of”. 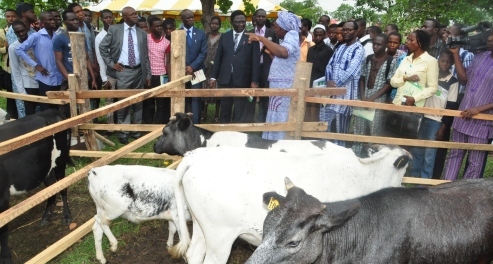 Earlier, in his Welcome Address, the Vice-Chancellor, Professor Oluwafemi Olaiya Balogun, said the FUFASS’ six-month intensive training in agricultural practices, is geared towards the enhancement and promotion of professionalism in the respective fields of endeavour in the home countries of beneficiaries or where such expertise are required. Professor Balogun disclosed , that FUFASS is solely funded by the University, covering allowance and entitlements, course costs, local transportation, feeding, maintenance and books/periodicals. The Vice-Chancellor appreciated the support of the Federal Government and its agencies, particularly, the Federal Ministry of Education, Tertiary Education Trust Fund (TETFund) and the National Universities Commission (NUC), as he appealed to relevant agencies for collaboration and sponsorship by corporate bodies. Professor Balogun gave a breakdown, showing the performance of the graduating students; made up of 3 Liberians, 2 Sierra Leonians and 6 The Gambians, which showed that 6 students graduated with Distinctions while the remaining 5 graduated with Upper Credit. The University’s Acting Registrar, Mrs. Christiana Kuforiji, later presented certificates to the beneficiaries.